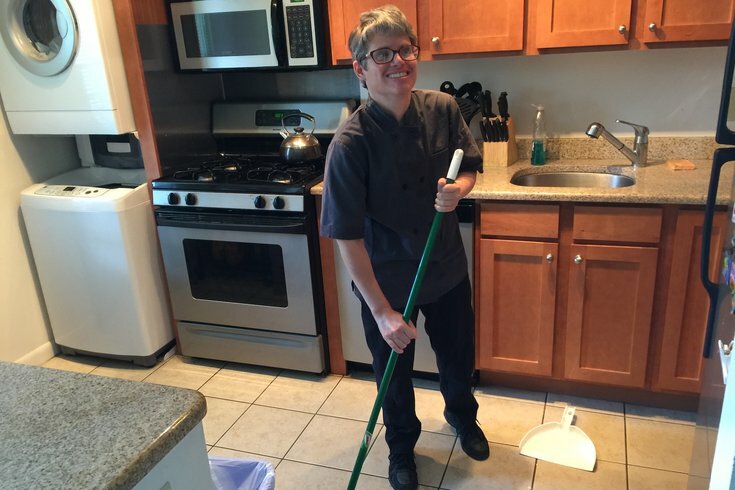 Susan Gelb is developmentally disabled, but thanks to a program that offers living and employment assistance, she is about to celebrate her 12th-year anniversary on the job with Villanova University's dining services. Several mornings each week, Susan Gelb walks about 10 minutes from the Bryn Mawr apartment she shares with a roommate to catch the Norristown High Speed Line to her job at Villanova University. The ride takes about 10 minutes, but the 48-year-old woman's commute represents a lifelong journey that can be held up as a shining success, and beacon of hope for others. Gelb, who works for the university’s dining-services program at Belle Air Terrace in the Connelly Center, is developmentally disabled. Years ago, few would have thought she’d be able to navigate the world on her own as well as she has. At a time when the commonwealth pushes to help the disabled find “competitive integrated employment," despite potential pushback from the federal level, hers is a story of success, a human face on a complicated issue. Oh yeah, she’s also celebrating 12 years on the job this month, and could barely contain her excitement about it when she spoke last week with PhillyVoice before heading out the door to work. Gelb did not find her way into a self-sufficient life without help. The Judith Creed Horizons for Achieving Independence (JCHAI) program helped lay much of the groundwork that makes it possible. “They were worried about what was going to happen to their kids,” said Stacy Jarrett Levitan, executive director of JCHAI, which uniquely pairs independent living with vocational services. Over the years, it has grown into a program that helps adults thrive in independent-living situations with a focus on finding jobs where they’re part of, and not pigeonholed away from, co-workers without disabilities. According to Levitan, the national average for “competitive, integrated employment” for people with disabilities is about 34 percent. At JCHAI, the employment rate is more than double that figure. Gelb – one of about 150 people in the program scattered across the region – cleans tables and trays, restocks condiments, silverware, and napkins and socializes with students, just like any dining-services employee. Gelb grew up in East Oak Lane and Northeast Philadelphia, where she went to Northeast High from her sophomore through senior years. Still living at home with her mother and stepfather after graduation – her birth father tragically died young of a heart attack – she held down a job from 1989 to 2003 until downsizing left her on the outside looking in. When she was about to turn 30, a life-altering shift arrived. Over the next several years, her mother found two important things: the JCHAI program and, in 2006, a job listing. Living at the time at the Presidential City Apartments along City Line Avenue, the commute was considerably more challenging: the Route 65 bus to 69th Street Station and beyond. The 44 to Ardmore. She remembered it well. Still, she said, she loves “the peace and quiet” that comes with living on her own. “I’m happy because I’m going to work. I get great evaluations,” Gelb said of her 11 a.m. to 3:30 p.m. shift. “People are so friendly. The managers are so nice to me. I get holidays off. There's air conditioning. I get a lot of exercise since I walk to all four floors at Belle Air. She knows this as the head of the program who's seen Walgreens examine the merits of disability inclusion, and a sister whose brother with Down syndrome is about to celebrate his 30th year on the job at an area library, a position he's held since graduating from Lower Merion High School in 1988. More than that, she said, “we’ve learned a lot about how much they can achieve. It’s better for all of us if we have a working population that resembles the actual population,” citing data that found nearly one in five Americans have a disability. She said Pennsylvania Gov. Tom Wolf’s “Employment First” push is a step in the right direction “but we still have a long way to go to ensure people with disabilities have access to all jobs.” Should this push fail to continue, consequences could be dire, predicted Levitan. For her part, and after a group trip to Washington, D.C., Gelb will start another year working at a place she loves, where she is surrounded by co-workers and students with whom she feels a lasting connection. She's clearly excited, both about work and life itself. Before heading to work last week, she started ticking off a list of movies premiering soon on HBO.